They are cheap trinkets like plastic beads and doubloons. People on parade floats throw them to the crowds who chant "Hey, Mister, throw me something". 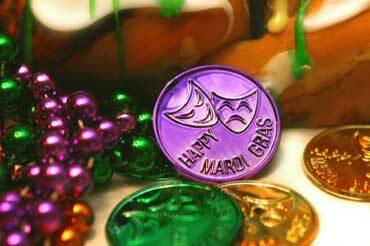 What kind of music is popular on Mardi Gras? Samba is popular on Mardi Gras. 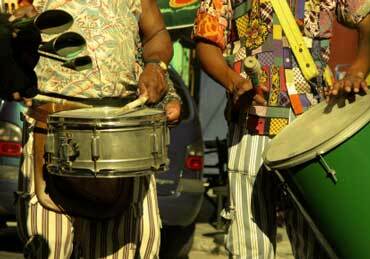 Brazil is the birthplace of Samba music. What do people eat for Mardi Gras? They eat King Cake. 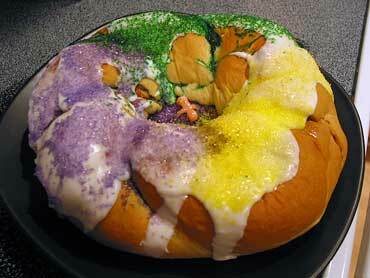 King Cake is decorated with purple, green, and gold sugar. It also has a baby hidden inside the cake. The person who gets the baby is the King or Queen and they have to buy the next King Cake or give the next Mardi Gras party. Copyrights to the pictures and photos on this EL Civics website belong to individual photographers. We have purchased the rights to use them. Do not copy the images on this education website. Permission is granted to copy any of the worksheets for classroom or home study. Contact Christina Niven, ESL teacher, at christina@elcivics.com. Please send corrections and requests for new lessons and worksheets. Copyright © Christina Niven, 2007.